The show, which runs to Oct. 20, is a multimedia exhibit featuring 29 pieces of artwork that are available for sale. Prices range from $60 to $5,000. In the exhibit, Saitlin, former visual art professor at Chicago State University, features multimedia assemblages and drawings. 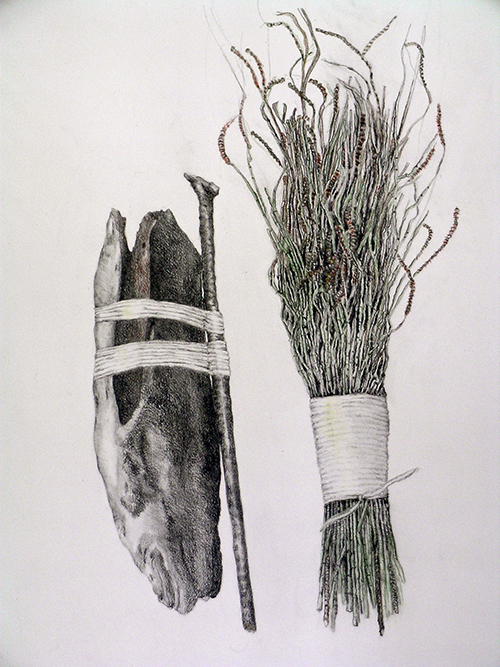 “Throughout time, people have created objects fashioned from materials found in nature and embodied them with meaning. Through my process, which begins with a piece of wood, branch or twig, each of my pieces takes on a personality, a likeness to an object, or an idea about the environment,” says Saitlin. 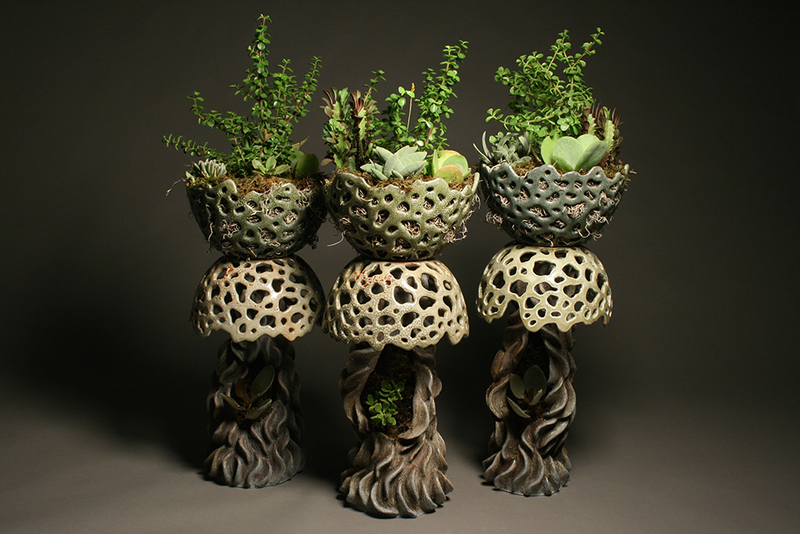 Shaw’s pieces symbolize the critical role organisms play in life on earth. Currently a faculty member at Armory Art Center in West Palm Beach, he expresses himself through clay altered by his experiences with the natural world. “My study, cultivation and experimentation with floral and fungal organisms have been a creative and transformative addition to my psyche and my work,” says Shaw. Saitlin maintains studios in Chicago and Boca Raton. She exhibits regularly with the Chicago Society of Artists Inc. and the Boca Raton Museum Artist Guild, among others. Her artwork has been seen on the cover of the Kravis Center for the Performing Arts playbill and at the Palm Beach International Airport. After receiving his bachelor’s degree from the University of Central Florida, Shaw relocated to South Florida where he began working at the Rare Earth Gallery in Stuart. Today, he maintains two distinct bodies of work, a functional soda or wood fire line of pottery and a sculptural line combining multiple clay bodies and firing methods coupled with various living and organic elements.